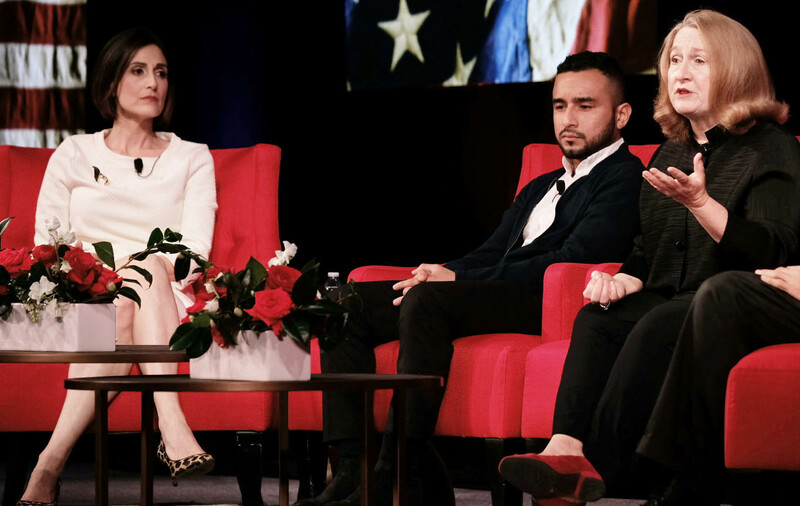 The LBJ School community of students, faculty, alumni and staff was proud to partake — on stage, in the audience and online — in The Summit on Race in America, hosted by the LBJ Foundation April 8–10. Civil rights leaders, activists, musicians and comedians gathered for three days of candid conversations on America's racial divide, discussing topics from voting rights and immigration to corporate equality, financial dignity, music and comedy. LBJ School Dean Angela Evans moderated a discussion on the ongoing quest for voting rights with panelists Jamie Azure, tribal chairman of the Turtle Mountain Band of Chippewa Indians; Julieta Garibay, the Texas director and co-founder of United We Dream; and civil rights legend Andrew Young, former UN Ambassador, congressman and Atlanta mayor. Professor Peniel Joseph, the Barbara Jordan Chair in Ethics and Political Values and founding director of the school's Center for the Study of Race and Democracy, delivered an inspiring presentation on social justice in America and the pursuit of what Rev. Martin Luther King Jr. called "the beloved community." Victoria DeFrancesco Soto, director of civic engagement and lecturer at the LBJ School, led a conversation on immigration, its challenges and the American experience today, with Thomas A. Saenz, president and general counsel of MALDEF; LBJ Professor and immigration expert Ruth Wasem; and Javier Zamora, an award-winning Salvadoran American poet and activist. In addition to the public sessions, LBJ students also met in a small, private setting with three other Summit panelists: American labor leader and civil rights activist Dolores Huerta, founder and president of the Dolores Huerta Foundation; Valerie Jarrett, the former senior adviser to President Barack Obama; and Yamiche Alcindor, White House correspondent for the "PBS NewsHour" and contributor for NBC News and MSNBC. Over the course of the event, LBJ students took over the school's Twitter account, @thelbjschool, and provided a running in-the-auditorium commentary on each session. Many thanks to Sam Lee, Salimah Jasani, Joel Carter, Amy Kroll, Renee Gadsden, Cara Pavlak and Melissa Bellin, who did a fantastic job. Below is a sampling of their work. Earlier today, @TheLBJSchool students were given the opportunity to attend a private Q&A with @DoloresHuerta and it was nothing short of inspirational! With 60 years of experience in grassroots organizing and advocacy, Dolores gave us advice for making our voices heard in Texas. This is @SalimahJasani, MPAff D.C. student at @TheLBJSchool, covering this morning's session at the @LBJFoundation's #LBJSummitonRace at the @LBJLibrary! Right now, Colette Pierce Burnette talks about self-reflection in the work to combat racism. Dr. Leonard N. Moore (@UT_HistDept) turns the conversation toward tensions between black and brown people. @TzintzunCris: at @Jolt_Texas, we connect the issues we face to other communities who have faced the same challenges, and we build solidarity together. @PenielJoseph amps up the activist energy in the last talk of this morning's session at the @LBJFoundation's #LBJSummitonRace. "We are Americans and global citizens and we tackle big ideas. There is no bigger idea that we can take on than this idea of racial justice." "Progress is very fragile, you can never rest." Topic: On the power of identity and its ability to politicize everyday conversation without the intention of the speaker. "Looking how I look, me talking about my experience as a woman makes me a political comedian." Meaningful representation starts at the top -- in the office where people in suits meet to make decisions. "Tokenism is always taken [as] a derogatory term because you've had to represent everyone who looks like you."... "If you can get people who look like you, it [can] become representation." Hi LBJ! @amyakroll here taking over this account for the @madeleine Albright session at the #LBJSummitonRace. I'm a former state department intern and @NDI staff, so pumped for the opportunity to share with you! Evening Session: "Motown: Sixty Years of 'Hitsville, USA'"
"The Supremes were three little black girls who dared to dream at a time when we weren't really citizens yet." Mary Wilson discusses the importance of the Motown Records community and how the Supremes were nurtured by artists who came before them. The panelists celebrate the Music Modernization Act, signed into law on October 11, 2018. The bill aimed to reform copyright and royalty-related issues brought about by new technologies. What an incredible way to end three amazing days at the #LBJSummitonRace! Thank you to the LBJ School for allowing me to keep y'all updated and to the @LBJFoundation for this excellent and honest event. @MissyBellin signing off!